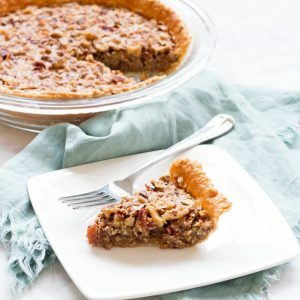 Try a bite-sized derby pie for the Kentucky Derby! 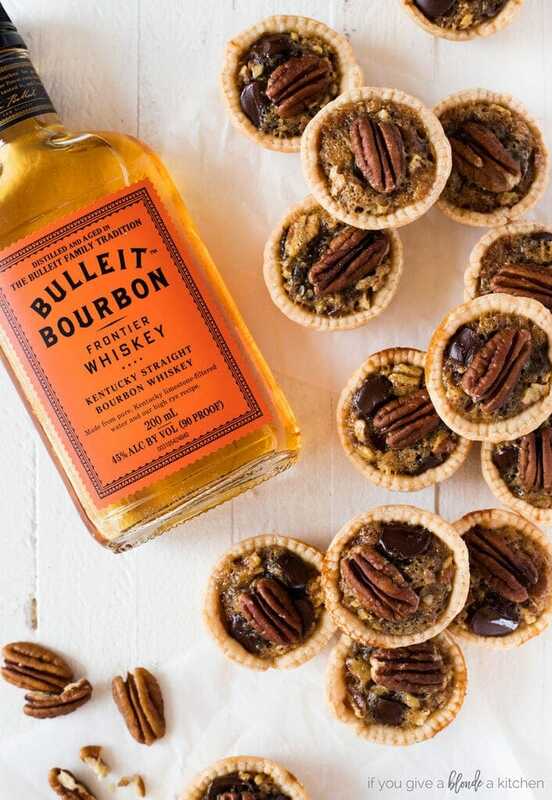 These mini treats have pecan pie filling with bourbon and semisweet chocolate chips. Yum! The next few days are back-to-back holidays. We have Cinco de Mayo on Thursday, the Kentucky Derby on Friday and Saturday, then Mother’s Day on Sunday! Yesterday I shared my recipe for no bake margarita cheesecake bites and today I’m sharing a recipe for these mini derby pies. What is in a derby pie? Is anyone wondering what a derby pie is? I can explain. A derby pie is a chocolate and nut tart in a pie shell and it was created by George Kern in Kentucky around 1950. 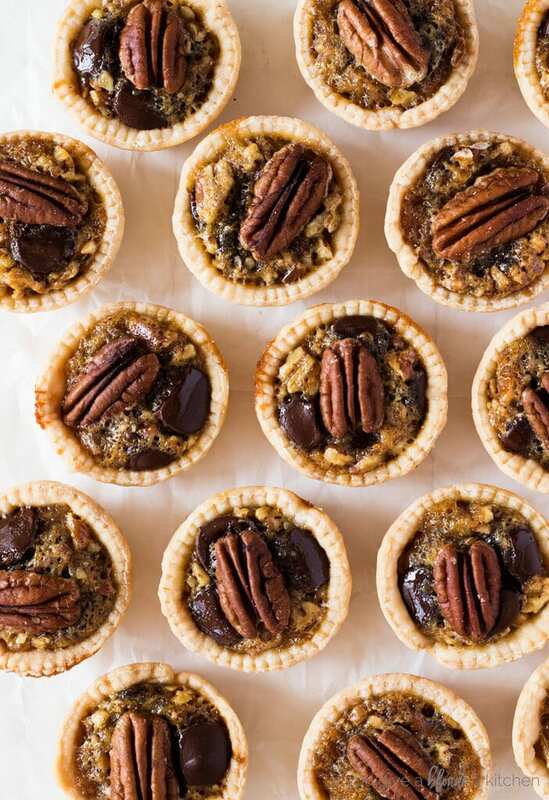 The majority of derby pie recipes call for pecans and semisweet chocolate. It is also common to add a bit of bourbon to the mix for an extra kick. 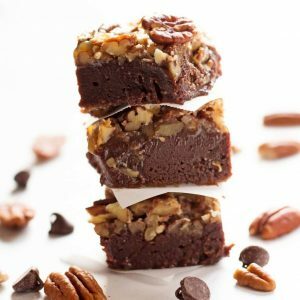 Naturally this dessert was adopted by Kentucky Derby fans and quickly became their go-to treats during the horse race. Mini pies are easy to bake in a mini muffin pan. Spray the pan with nonstick cooking spray so the pies remove easily. Next, roll out some pie dough and use a 2-1/2 inch diameter circle cookie cutter to cut out the pie crusts and place them in the mini muffin pan. Fill the mini pie crusts with the filling and bake! Seriously it’s that easy. For derby pies, I like placing the chocolate chips and chopped pecans in the bite-sized pies prior to filling. Each mini treat will have the right ratio of ingredients! 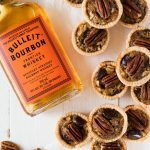 Whether you watch the Kentucky Derby every year or you are attending your first derby-themed party with friends, I promise you these mini derby pies will be a hit. Preheat oven to 325° F. Spray mini muffin pan with nonstick spray. Using a 2 1/2-inch round cookie cutter, cut out circles of pie crust dough and place in the muffin pan. Sprinkle pecans and chocolate evenly in bottom of each pie shell.1 Set aside. In a large saucepan, combine corn syrup, sugar, brown sugar and bourbon. Bring to a boil over medium heat and stir constantly for 3 minutes.2 Remove from heat and set aside. In a medium bowl, whisk together eggs, butter, cornmeal, vanilla and salt. Gradually whisk about one-fourth of the hot corn syrup mixture into the egg mixture (this will help the eggs from solidifying)3. Transfer egg mixture to the large saucepan with remaining hot mixture, whisking constantly. Pour two teaspoons of filling into prepared pie crusts, taking care not to overfill.4 Fill about two-thirds full (a small cookie scooper is a good measurement). Once filled, top each pie with a pecan half. Bake at 325° for approximately 25 minutes or until pies are set and crust is golden. Cool in pan for 5 minutes, then remove pies and cool completely on wire rack. 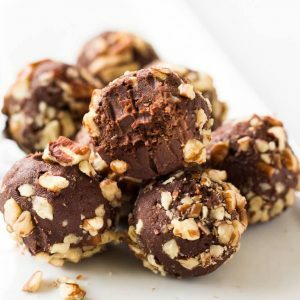 I placed 1 scant teaspoon of chopped pecans and 3 Ghiradelli chocolate chips in each shell. I suggest using a silicone spatula to stir. This helps to keep the mixture from sticking to the bottom of the pan. If some of your egg bits solidify, pour your filling through a fine mesh strainer before adding into your pie shells. Overfilling will make the mini pies harder to remove from the muffin pan. I used a small cookie scooper as a good measurement. Store mini pies in an airtight container at room temperature for up to 5 days. To freeze mini pies (up to 2 weeks in advance): Bake and cool completely. Individually cover the pies in plastic wrap and then aluminum foil. When you are ready to eat them, unwrap the pies and defrost them in the refrigerator (should take 2 to 4 hours). Then either bring to room temperature or reheat in the oven. Recipe adapted from Home Is Where the Boat Is. We used to make a sheet pan version of this pie, but never bite-sized. I have to try these next time we have a Derby party! Yes! I’ve done the full pie version too, but wanted to try a bite-sized treat. Perfect for entertaining! Hi Verna! They are made in a mini tin. Hi Amber – yes, they can. I advise making them no more than two weeks in advance. After the mini pies cool completely, individually cover them in plastic wrap and then aluminum foil. When you are ready to eat them, unwrap the pies and defrost them in the refrigerator (should take 2 to 4 hours). Then either bring to room temperature or reheat in the oven. It’s important that you defrost in the fridge first because if you defrost at room temperature they will thaw too quickly and get soggy from condensation. Enjoy! Can I make these 2 days ahead and just keep them in airtight container without refrigeration? Hi Deette! Yes, you can although everything tastes better when made the day of! But sometimes you do have to bake things ahead of time. Store them in a cool location out of direct sunlight in an airtight container. Does it matter if you use white or yellow cornmeal? The picture looks like a regular sized cupcake pan. Is that right? Or is it the minis? 4 inch circle seems like it would fit a regular one. Hi Melissa, it’s a mini cupcake tin. I just double checked the cookie cutter I used for this recipe and it is 3-inches in diameter. Thank you for bringing this to my attention. I have updated the recipe. Just made these last night to send in for my daughter’s 4th grade “Taste of Kentucky.” I had to sample one, of course. It was pretty much amazing! I may or may not have added extra chocolate LOL. And I do dark chocolate. I also just left out the cornmeal as I didn’t have any of that. I halved the recipe but now I wish I would’ve done the full amount LOL!